Lenses supports Kafka versions 0.10.2+. Kafka 0.11.0+ is strongly recommended. 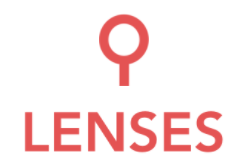 The current version of Lenses is v2.0. See Release Notes. For those upgrading from 1.1, please see the Upgrade Notes. For Docker, Kubernetes or Openshift environments a docker container for Lenses is available under landoop/lenses. Find additional information here: https://github.com/Landoop/lenses-docker . If you are looking for a Lenses Development Environment (free) just download it from here . It is recommended that Lenses is deployed in the same data center as the Apache Kafka cluster it links to. See more on supported Java Options in the configuration section. Lenses for Apache Kafka has been tested with the Apache Kafka releases version 0.10.2 upwards. We strongly recommend 0.11.0 or greater. Distributions from i) Apache Kafka ii) Cloudera iii) Confluent and iv) HortonWorks are endorsed. Other distributions and custom builds should work as well. Lenses supports multiple types of Kafka message payload with Json and Avro being first class citizens. Alongside these two the following payload types are also covered: String, Long, Int and binary content. If Schema Registry is used, the platform provides easy schema management and more. See JMX section for more details on enabling JMX. security.conf file contains the security configuration. For more information, read Security. Once the configuration is complete, Lenses is ready to run. We recommend running 1 instance of Lenses per Kafka cluster. Running multiple instances against the same infrastructure, (if not configured appropriately) could result in Lenses SQL processors duplicating data if the processors are set to run in the same process as Lenses. Once the application is running, open your browser and navigate to http://address:port based on the configuration file. The default is http://localhost:9991. Log in using the credentials you have provided, otherwise the default values are admin:admin. We strongly recommend changing the default credentials! The above ports are only for reference only. After enabling JMX on each service you will have to restart the service. Ensure the ports are reflected correctly in the lenses.conf file. A JMX agent starts automatically for Lenses. This behavior and which endpoints to poll can be configured in the JMX section of the configuration file. The configuration file may be placed under /opt/lenses/lenses.conf, /etc/lenses/lenses.conf or passed in at the command line when staring Lenses. Lenses does not support SSL termination but rather relies on a proxy set in front of it (such as Apache, nginx and Caddy) to provide SSL to clients. Attention should be given to set the proxy to support websocket connections under the path /api/kafka/ws.